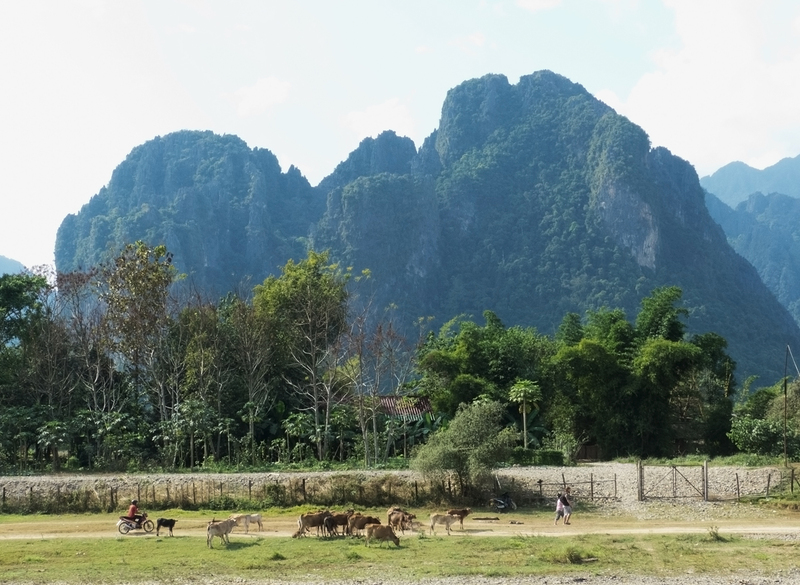 By mini bus from Vientiane to Vang Vieng. Oh dear God that was a journey. There are sixteen of us plus the driver: two rows of four, and three rows of three. Everyone and their luggage squished in worse than sardines. And everyone but us is under thirty. Don and I are the last to be picked up so we’re in the front with the driver. This is something I’d normally be delighted about. The best seats. The best view. Don and the driver are in regular seats. They may even have seatbelts. They may even be wearing them. I am in a narrow raised seat jammed in between them. No seat belt. My head about 15 inches from the rearview mirror and the windshield. Feeling very vulnerable. Travelling fast. Narrow winding road. Then the driver gets out his cell phone. Talks a bit. Starts flipping through it for numbers or something, looking back and forth from road to cell phone. Tension mounting. Then for God’s sake he gets out another cell phone. One in each hand, as his hands rest on the steering wheel. Looking back and forth between the two. No let up in speed. Now I’m getting close to terrified. Suddenly I scream “what are you doing? !” and some other words I don’t remember. He responds by putting away the phones and speeding up. I guess he has a reaction to being yelled at. After a while he slows down again. I apologize. Twice. By this point I’ve learned how to say I’m sorry in Lao. He waves it away, but it is not a dismissal. Obviously he is angry, but I pick up in his gesture an acknowledgement that he shouldn’t have been doing what he was doing. A bit later we stop for a lunch break. One of the other passengers takes it upon himself to explain to me that public displays of anger are considered offensive in Asian cultures. As if Asians have a premium on that. He said I shouldn’t have gotten angry I should have ‘dug a little deeper’. He said I put everyone in danger. As if we weren’t already in danger. I called him arrogant which made him angry, which I pointed out to him. Perhaps he reacted spontaneously and in that moment was not able to ‘dig a little deeper’. Or perhaps it was okay for him to get angry with me in public because I’m not Asian. It was a very interesting conversation. I won. 29-30 January 2013. 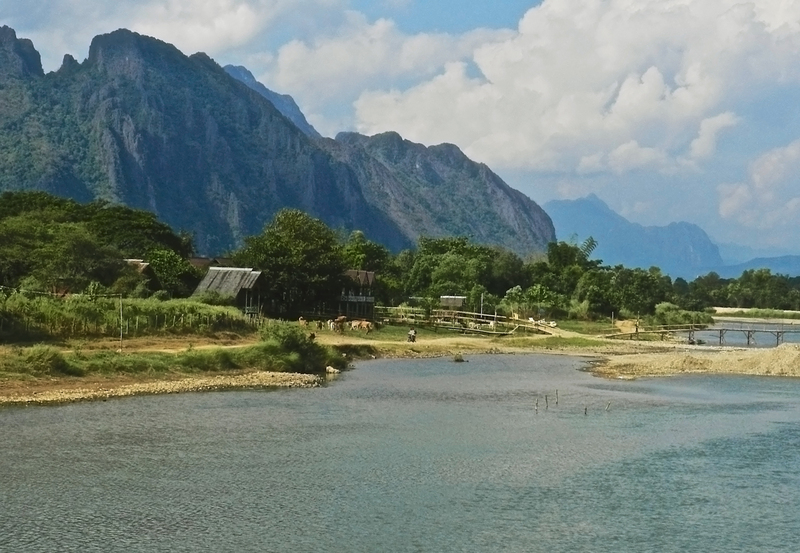 Vang Vieng turned out to be one of the best places ever and we only had an afternoon, overnight, and morning there. 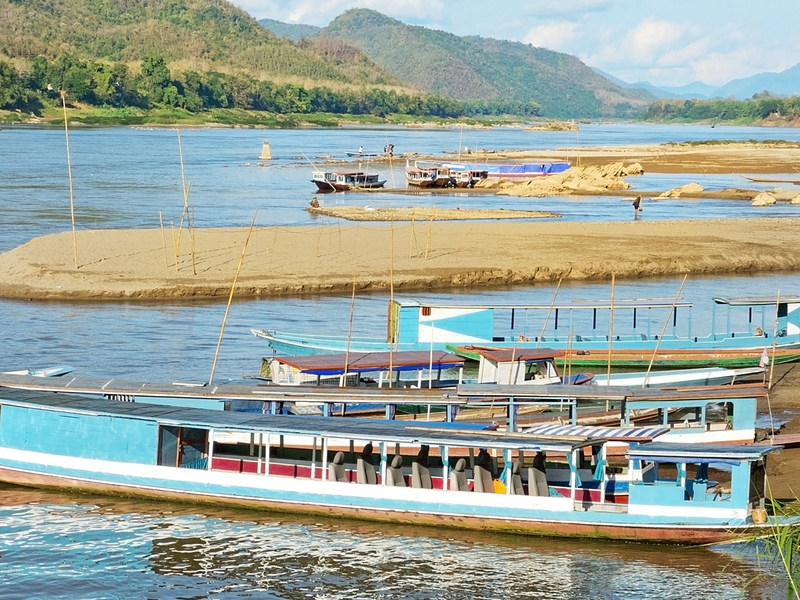 We’d heard that it had been over-run by backpackers who had taken to getting so stoned and drunk while tubing down the river that in recent times, in separate incidents, six of them had drowned. So the government put an end to it all. Kind of – there was still plenty of tubing and beer drinking going on, but from what we read beforehand we thought that it would be party town, and not really our thing at all. How wrong we were. We went for an evening boat ride, and a short hike on the other side of the river the next morning. We could have easily filled another two days there, hiking, kayaking, and even a little tubing. Still we’d already booked our hotel in Luang Prabang so got on the full-size bus the next afternoon as planned. 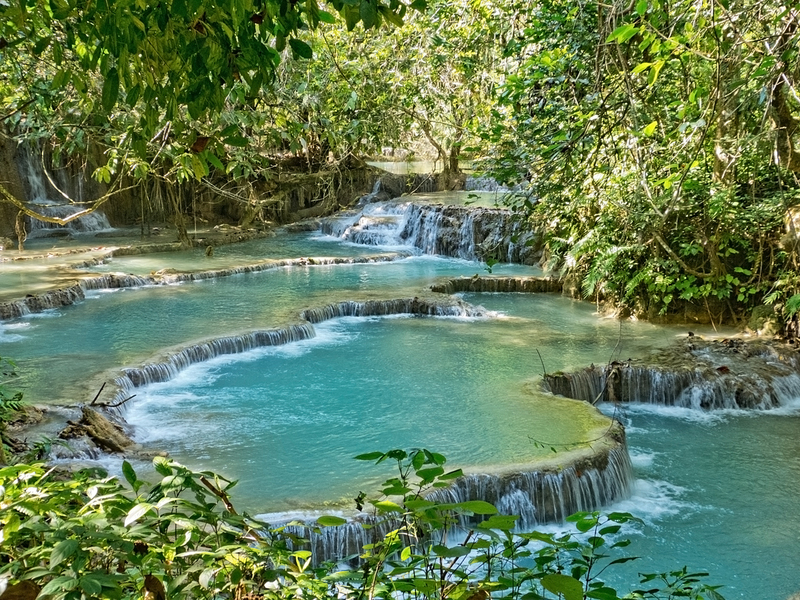 We’d originally planned on staying only six days in Luang Prabang but loved it so much we stayed twelve, so could have swallowed the extra hotel cost and given up a couple of those days for Vang Vieng. Twenty/twenty hindsight always so clear. It’s sometimes the way it goes. We do our research on the net, but you can never really know until you actually get there. 30 January-11 February 2013. 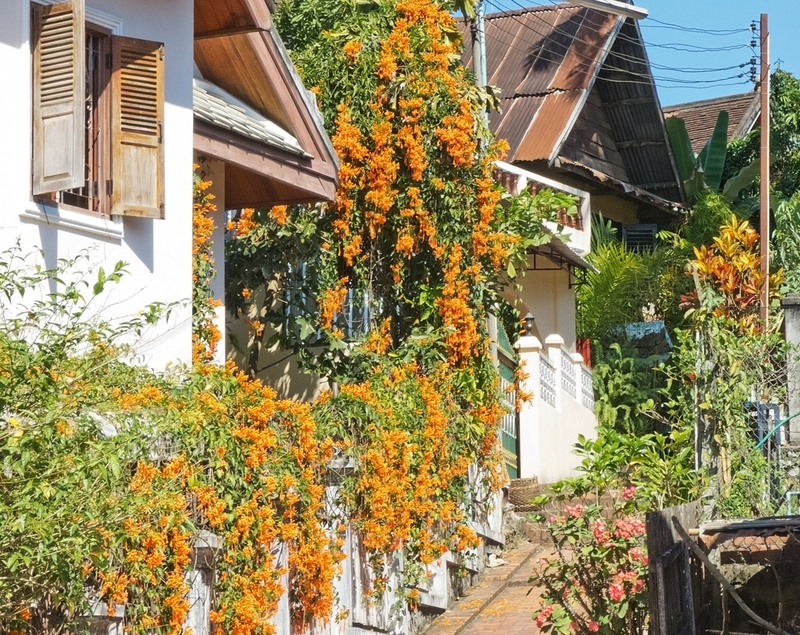 What a sweet lovely town Luang Prabang is, and a great tourist mecca for no other reason than that really. It’s a Unesco World Heritage Site. 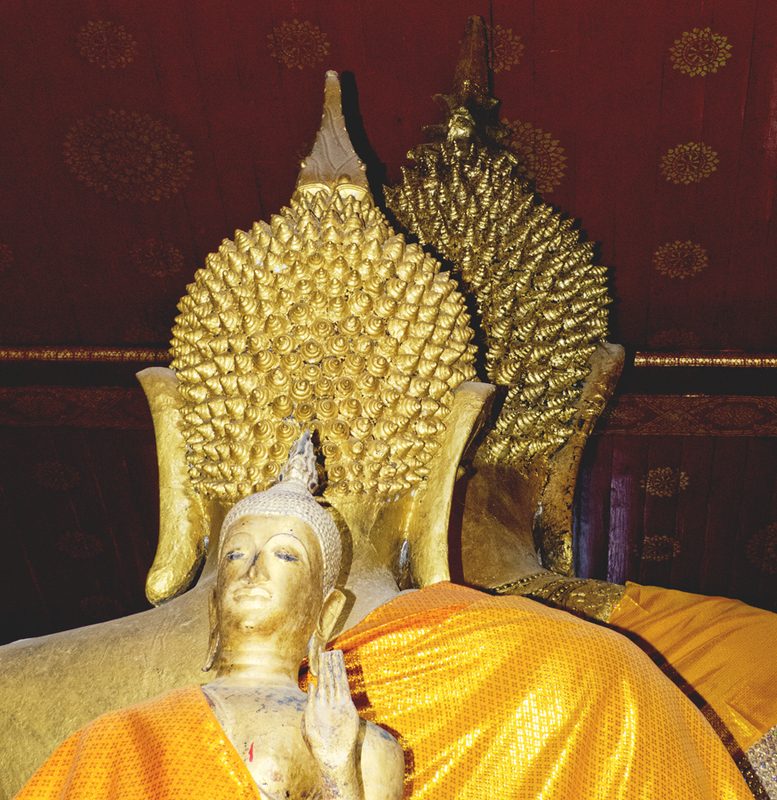 Many temples, many monks, a fabulous night market for dinner, a beautiful setting on the Mekong and Nam Khan Rivers, some lovely French architecture, and an all round gentle place to just stop for a while. So we did. 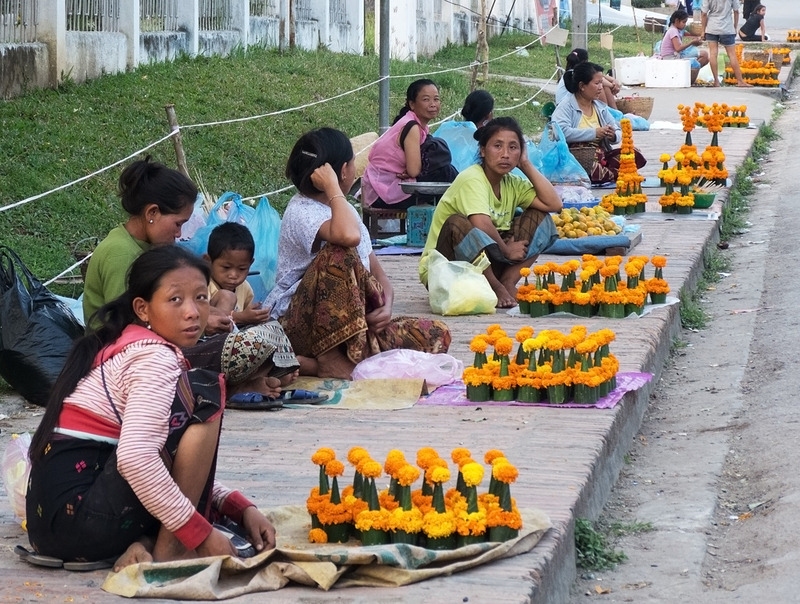 Selling altar offerings. I thought the centres were made from some kind of palm leaf, cut, folded and pinned together. Now I think perhaps they are some other kind of tropical leaf. A quick net search didn’t give me the answer. The flowers are marigolds. 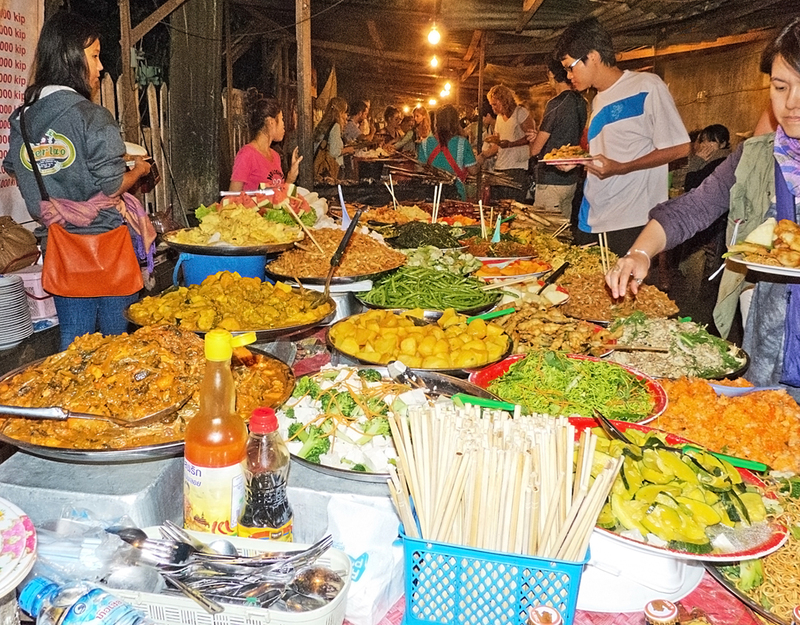 The night market – a long alley filled with large tables laden with many dishes, interspersed with coal barbeques cooking fish and chicken, and wooden tables and benches for seating. 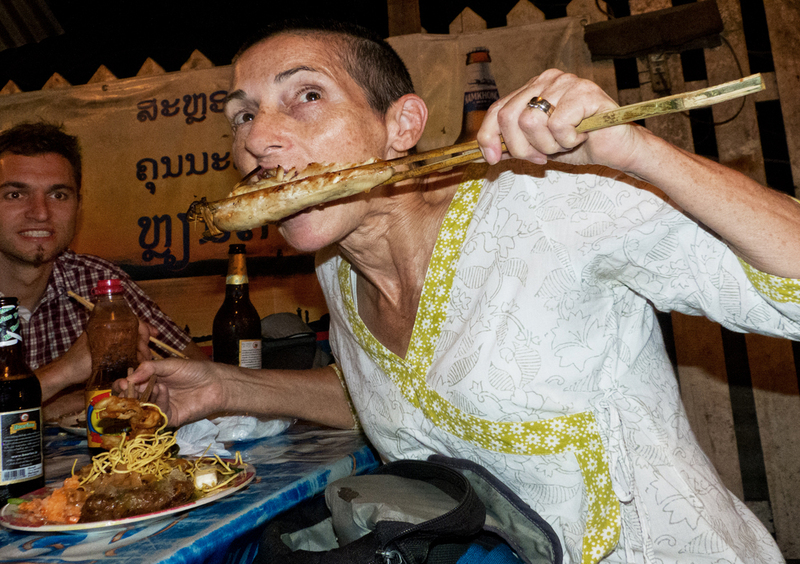 Buy a piece of fish or chicken, a Beerlao or two, pile up your plate, and sit at whatever table you can find. Total cost for the two of us? About ten dollars. We ate there three or four times and had some great conversations with fellow travellers. One conversation I remember was a man saying Guatemala wasn’t really a safe place to go, and the woman next to him saying she loved it and had a fabulous time there. Go figure. Maybe we’ll go find out for ourselves one day. We shared the biggest and tenderest chicken breast on earth. and went to the local waterfalls. What a stunning place, much bigger in scale than can be captured in a photograph. Pools and pools and pools of beautiful turquoise water dropping down level after level. Many people swimming, but not us. Instead we climbed up to the top, all the way across the top, a slippery treacherous path through the water, and down the other side, feeling courageous and intrepid. Mission accomplished! We looked at the pools. So inviting. Then dipped our toes in. Not so inviting. Umbrellas on bikes. Both push bikes, and motorbikes. It’s a very common site. If there’s no passenger the driver carries it. 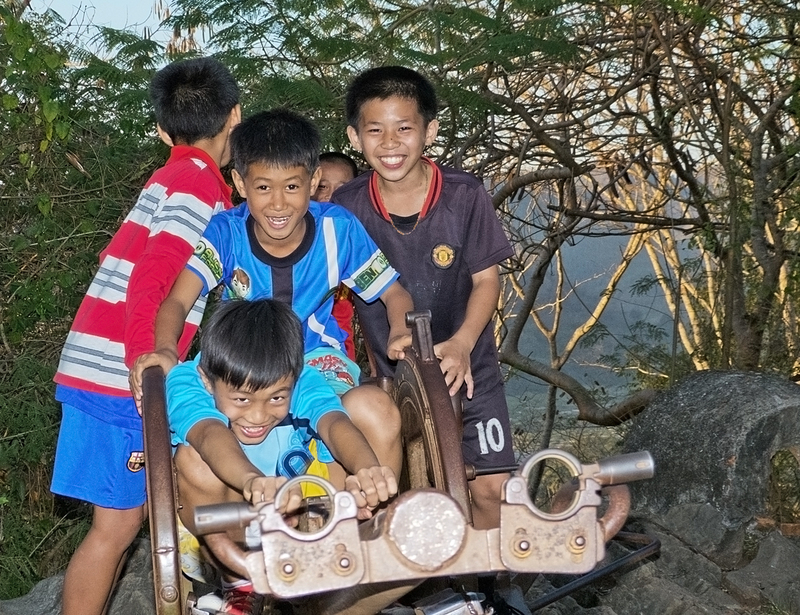 The remnants of an old anti-aircraft gun emplacement at the top of Phousi Hill makes a great revolving play-ground for these boys. They were having so much fun! 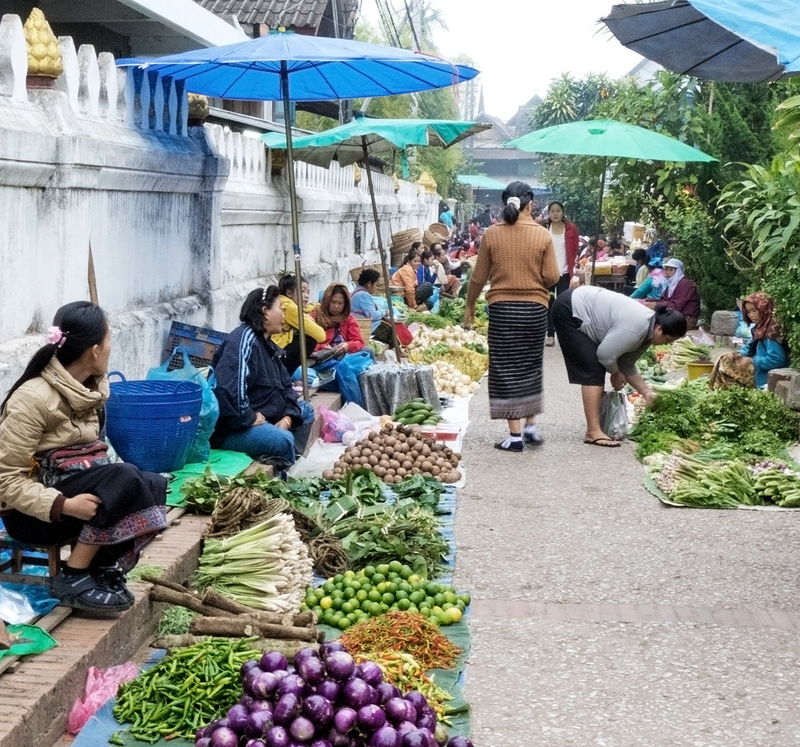 Every morning at about six, in an age-old custom known as Tak Bat, all the monks, hundreds of them, leave all the monasteries and walk through the streets collecting alms, mainly in the form of food. 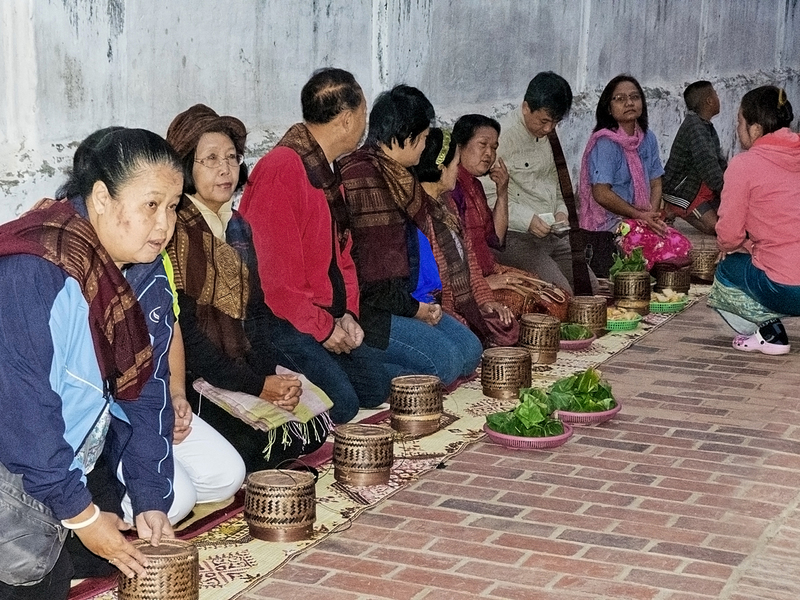 Most of the people giving food these days are tourists apparently, but we did also see many Lao people there as well. The ritual is done in silence as it is a meditation for the monks. 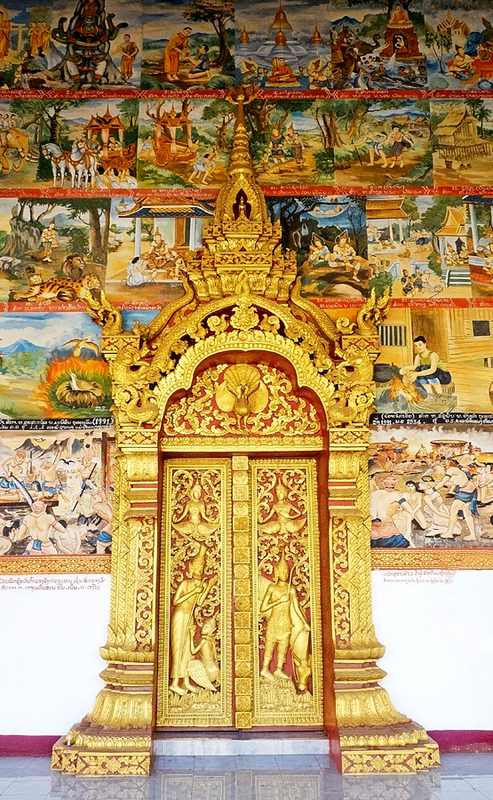 According to wikitravel, the monks would like to discontinue the practice but have been threatened by the government that if they do they will be replaced by lay people dressed as monks to ensure the continuance of tourist income into Luang Prabang. All a bit sad really. But lovely to watch, and really not such a hardship for the monks even if the practice has been sullied somewhat. 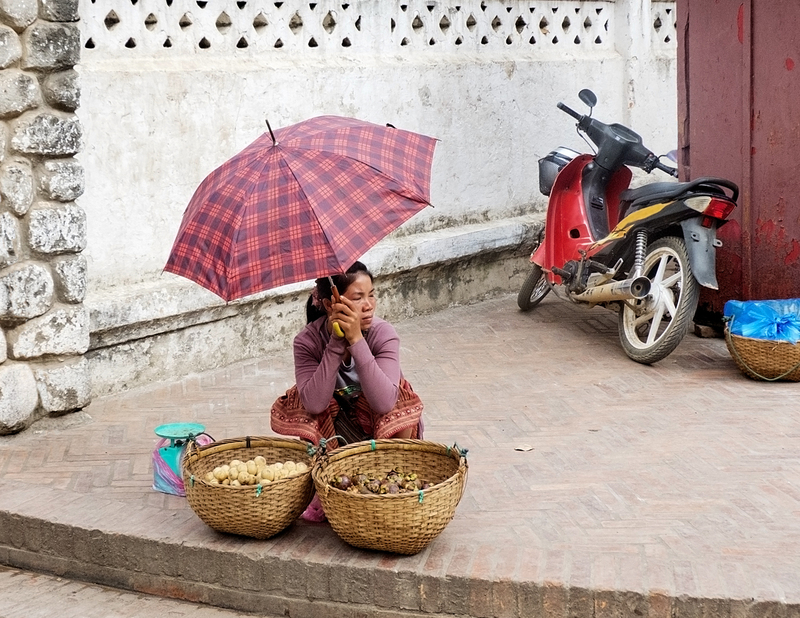 There are worse things in life than being watched while you walk along the street and collect offerings of food. 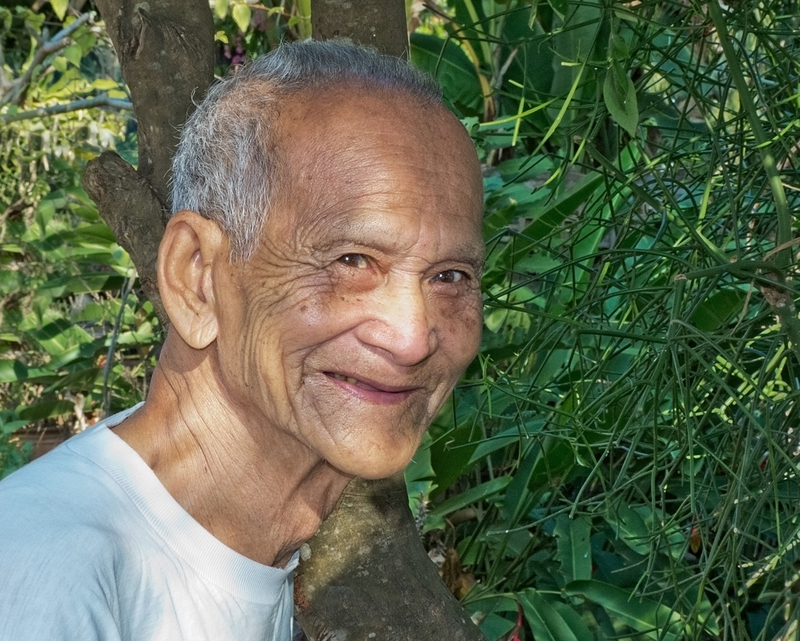 Next post: Trekking, ‘swimming’ with elephants, kayaking, and a boat trip to a temple cave, making some new friends, and the village across the river. Stunning pictures! I’m hiking those trails in my mind now..vicariously hiking is safe right? holy shmoly bus ride from hell Alison! .. sure makes for a great story now that you are safely at your destination..
I’m so glad you yelled at the driver! I was getting frantic – could feel the tension..
Yeah, I was getting pretty frantic myself lol. I’m not sure a quiet request to the driver would have done the job. I appreciate your reaction to the way I’ve written about it. I was trying to convey the feeing of how it was for me. Holy crap, I was anxious reading about that bus ride and what happened. I understand cultural variations but hey, life saving screaming trumps everything in my book and I’m sure behind veils of beliefs and conditioning there would is wider consensus. The photos are Natl Geo quality and exquisite. The juxtaposition of the photos and story left me feeling, hmmm, nauseated with a smile. (not kidding). Yes, I too understand cultural variations, and respect them as much as possible, but yeah, I agree, sometimes screaming trumps everything. Don’t care if people think I’m “ageist”, or whatever, but I couldn’t believe I then had some twentysomething little snot telling me how I should and shouldn’t behave. 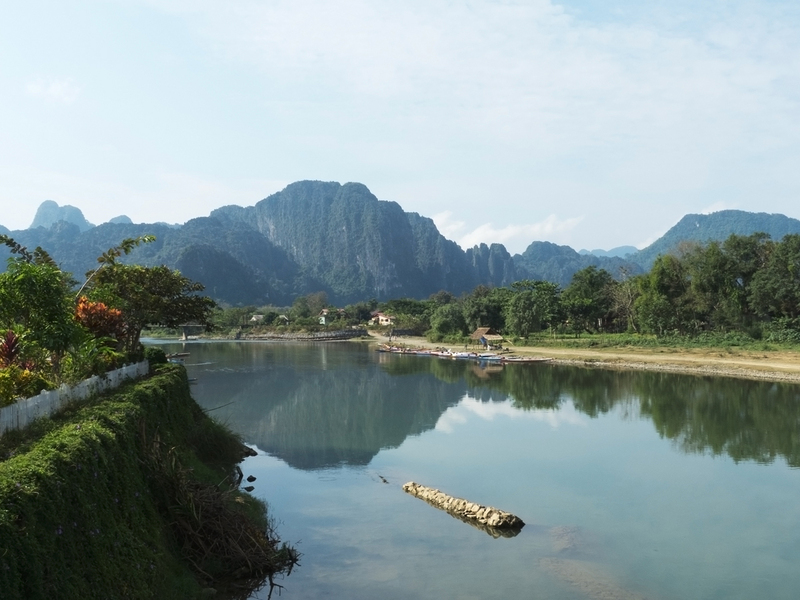 Juxtaposition – you mean the van ride followed by the photos of beautiful Vang Vieng? Sorry for the nausea. 2 cell phones while driving??! Sometimes I wonder if all the conveniences of the cell phone are worth the huge societal change it has caused worldwide. Glad you survived, Alison. The pools and waterfall hopefully washed away the frustration. 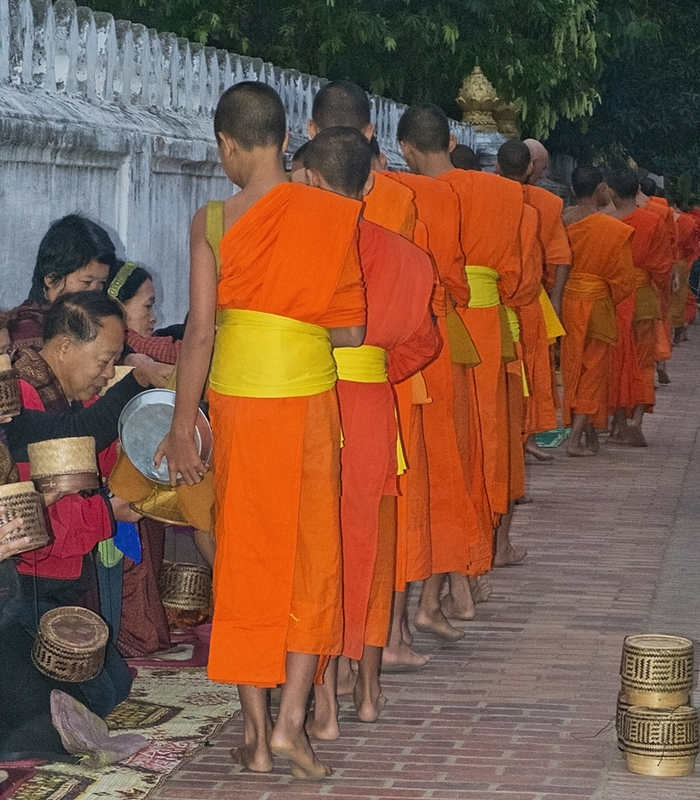 Such a shame that the government forces the monks to beg for alms. Even in these countries there is a mixture of church and state that makes both suffer. 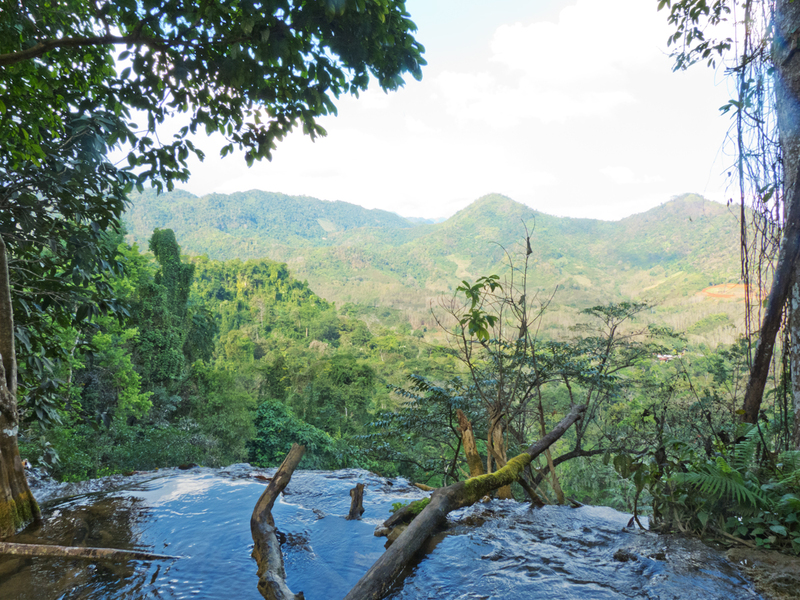 And Vang Vieng certainly washed away any residual tension – such a beautiful place. I also should have specified that I got the info about the government ‘encouraging’ the monks to continue their alms practice from wikitravel. I do not want to disparage wikitravel, but we all know that at times wiki is not the most reliable source of info. However I’m sure it is correct when it says that there have been obnoxious tourists who do not understand that for the monks it is a walking meditation and having camera flashes go off right in their face is very distracting, not to mention very rude, and that there have been young westerners giving food while inappropriately dressed (ie bare shoulders, cleavage, shorts, etc) just to be part of the parade, again not being respectful that it is a meditative and religious event. I guess there’s always two sides to any story. I can understand why the monks are reluctant, but maybe now hopefully the word is getting out and people are behaving better. It’s a very good bucket list part of the world. Just wait til I get to write about Myanmar! Now there’s a country worth seeing. Quite astonishing. Hi Pam – I do agree with you that at times a raised voice is exactly what’s needed. I was scared at the time and reacted spontaneously from fear, but I don’t for a second think it was anything other than exactly what was needed to bring the driver back to presence and his responsibility. Also I can be pretty fierce when life calls for it. I long ago gave up the idea that being spiritual means being all sweet and soft and gentle all the time. I have thought that if I’d spoken gently he may have put the phones away, but would not have remembered (or cared about) the “lesson” for the future. This way he’s unlikely to forget. Also, as I said to Paulette, I wasn’t about to have some twentysomething little snot tell me how I should and shouldn’t behave lol. I had that top made in India. I saw another woman wearing one that she’d bought in Delhi I think. I chose the fabric, and then she lent it to me to take it to the local taylor to copy. I also had another made in a patterned indigo with turquoise trim. Your photos, particularly your portraits, are superb. I enjoy hearing your stories–the cell phone story was very scary. Thank you so much. I think I’m getting better at photography generally but a lot of it is still hit and miss. Yes, the cell phone incident was very scary. 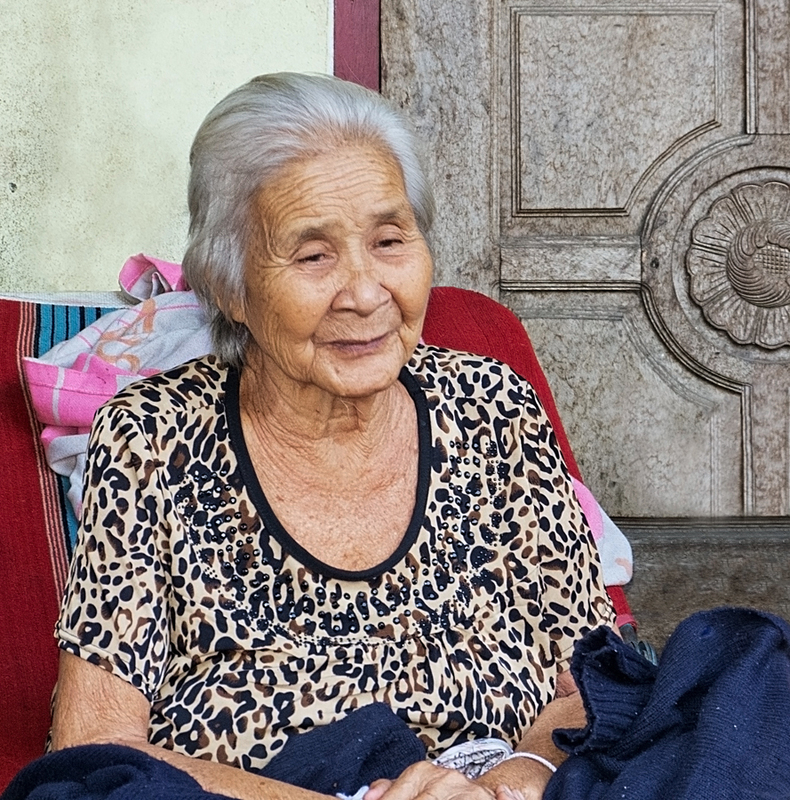 I have lived 30 years in Asia (15 in China) and I have learned to reach a happy medium between respecting the culture while speaking up for gross injustice. Overly sensitive Asian are often obnoxious to the dangers that they are IMPOSING on Westerners (other neighboring country visitors might take Asian behavior as the standard since this is the way things are done at home). The bottom line is that if SEA countries want to earn $, cater and receive Western culture visitors, they will also need to bend their standard for safety’s sake. You might end up handicapped for life because you did NOT speak up. That goes for trivializing the fact of overcharging and lying to the WHITE man or being dishonesty and deceptive as it were the national duty. Justice and Truth should prevail and transcend EVERY culture and we must speak up in a gently and polite manner when the situation arises. BUT we must speak up. Thankfully, these situations might be an exception. I have met many well intended backpackers who are getting weary of being cheated all over SEA to accommodate the natives. But perhaps, this is part of the thrill and “experience”. I do agree that there’s a happy medium between respecting the culture and speaking up when necessary, but in all honesty when it feels like my life is on the line I’m not remotely interested in respecting the culture. That’s when speaking up becomes imperative. Overall I have to say our time in SEA was fabulous, and the people welcoming and wonderful. This really was just one incident. 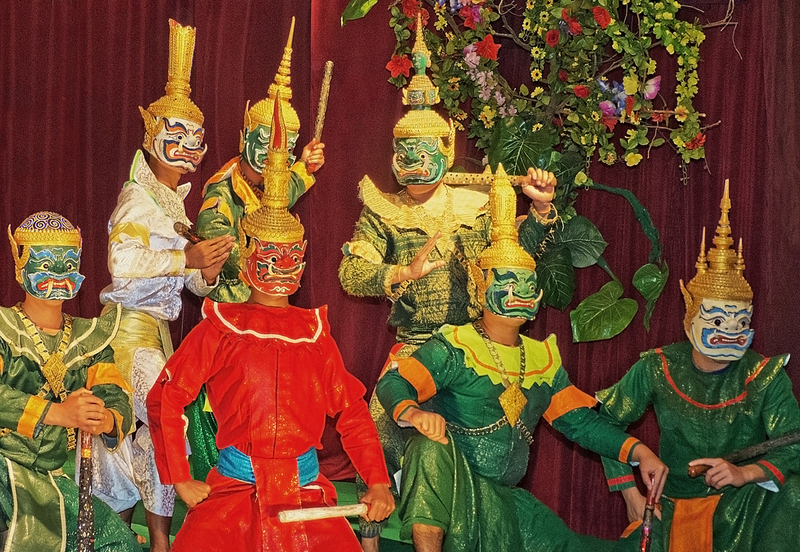 We had some issues in Vietnam with not getting all we were promised on a couple of tours, but we had a good time anyway. I also spoke up quite loudly on one of the tours in Vietnam that had the effect of bringing some good results. 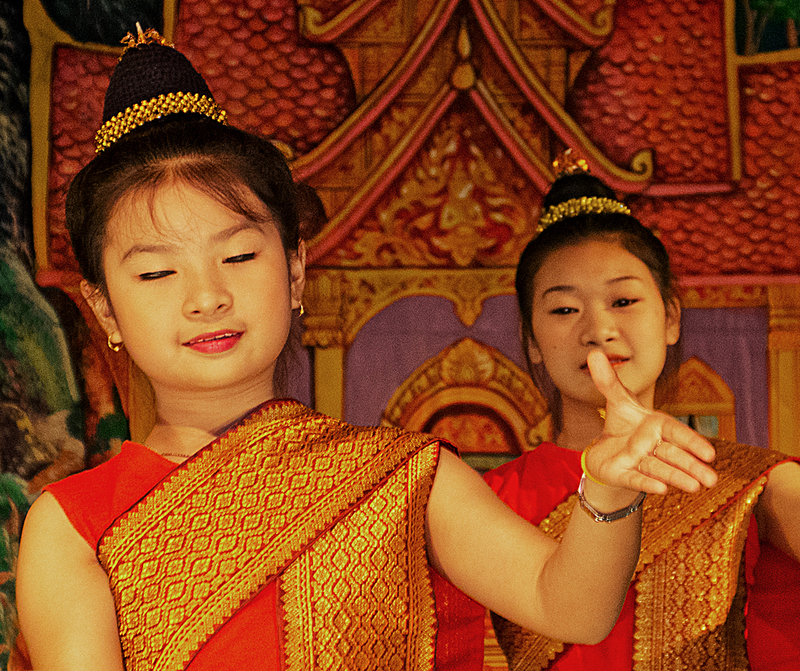 Generally all the people we met – in Laos, Cambodia, Vietnam, Thailand and especially in Myanmar were welcoming and friendly. 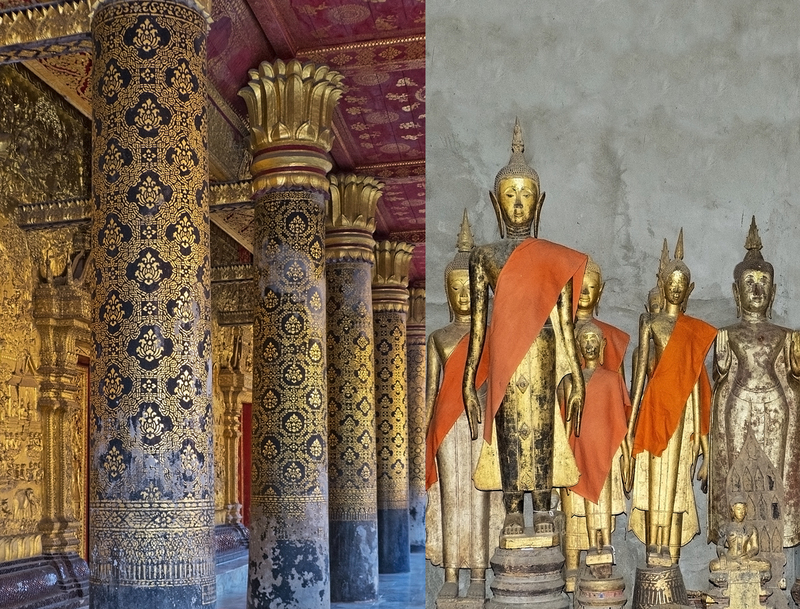 I think it’s probably true to say that many Asians in the tourist business see westerners as very wealthy, or at any rate wealthier than they are and so they try to get as much as they can from them and who can blame them for that. H Kate, sorry I can’t help you. We didn’t keep a record of who we travelled with and must have paid cash. We booked through our hotel. I would think that any hotel or hostel would be able to make a booking for you, or any travel agent on the street. I love your reaction to the guy who called you out for calling out the terrible driver. I side with you – sometimes you have to tell someone to slow down. By the way, the photos in this post are stunning. Great job. 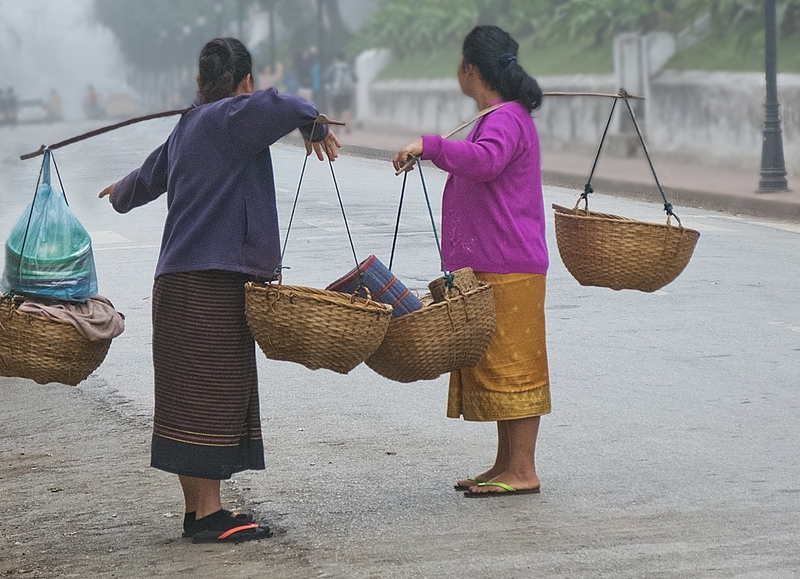 I flew from Hanoi to Luang Prabang and then took the slow boat north for 2 days to Thailand, so I never got on the roads in Laos, but I here they are among the worlds worst. We heard about the slow boat to Thailand but ended up flying instead. Roads in Laos not nearly as terrifying as India or Vietnam – at least in terms of crazy traffic. Hi, I wondered if you can give me some advice. We are going from VV to LP in a month and have realized that the road sounds very precipitous, with lots of sheer drops. My partner is very scared of precipitous roads! Can you tell me if the precipitous roads are for most of the journey or just a small part of it? 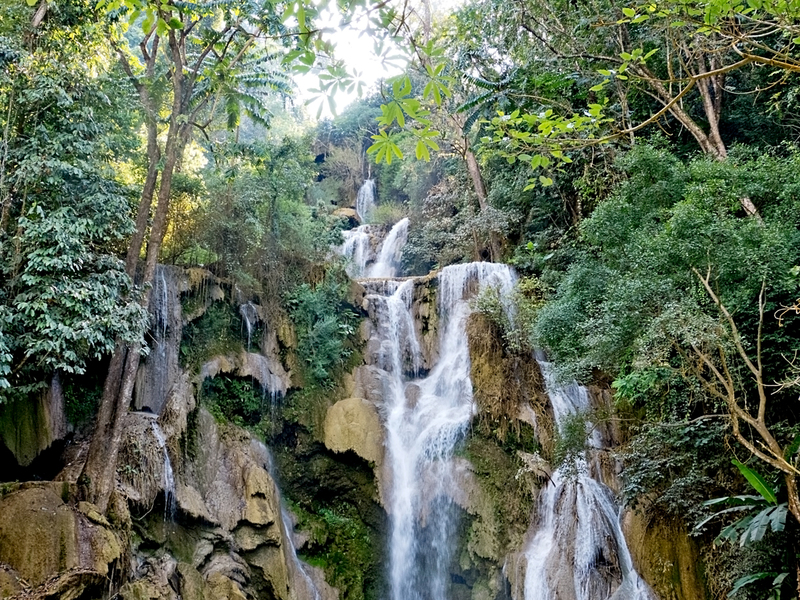 And as we are going toward Luang Prabang is that side of the road next to the sheer drops on away from then? Thanks so much. Hi Betty, I can’t be much help I’m afraid, as I don’t remember much. It was a long time ago. I do remember we were in a bus, not a minivan, which was much better. I remember hanging out at the front steps of the bus for a long time so I could see the scenery. I don’t remember ever being afraid, either of the road, or of the way the driver was driving. I remember chatting a lot with a fellow passenger who was also hanging out at the front steps. I remember it being a relaxed and uneventful journey. Precipitous roads? Sorry, I don’t remember if they were or not, but then I’m not afraid of precipitous roads unless the driver is crazy, and our driver wasn’t.